I usually listen to audiobooks as I'm simply unable to find time for reading. I work from morning till late evening and then only have some free time when my daughter is asleep. That's why audiobooks are a perfect solution for me as I can listen to them while I walk to and back from work or when I paint miniatures. However, some books can't be translated to this medium. 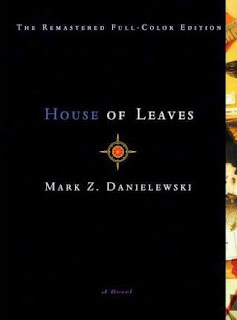 "House of Leaves" is definitely a unique novel. It starts with a story of John Truant. He works at a tattoo parlor and wants to find a new place to live. His friend Lude tells him of a man called Zampano who has recently died and vacated an apartment. In the apartment John finds his manuscript that is an academic study of a film called The Navidson Report. At this point the two narratives become intertwined. For clarity's sake, each of them is printed in different font. It deals with various documents and a film connected with a very unusual house. When Navidson moves in with his wife and two children, they soon discover that it is actually larger inside than outside. Their bewilderment turns into shock when they discover new doors leading to a long, dark corridor, which appeared in the house during their absence. This is the basic plot, the real story begins when Navidson begins exploring the newly discovered space. There Danielewski's post modern approach to writing really begins to show. The placement of print becomes apparently chaotic, at times it is even necessary to turn the book upside down in order to read. Some pages are filled with chaotically placed sections with various texts, others have just two words. At first glance it might seem gimmicky but it all all cleverly designed to reflect what is happening and the emotions that the protagonists are experiencing. The book is also filled with numerous footnotes, many of which refer to works that don't actually exist. And one more thing - the cover itself is symbolic as it doesn't cover the whole page. I suggest googling the title and having a look in the graphic section to get a good idea what I'm writing about. I have to admit that first 50 pages were hard to get through but once the proper action started and the layout became more unusual, I got sucked in. I read the rest of the novel during two longer sittings. I love this book, it's unique and interesting to find that the actual text of a story helps convey another layer.